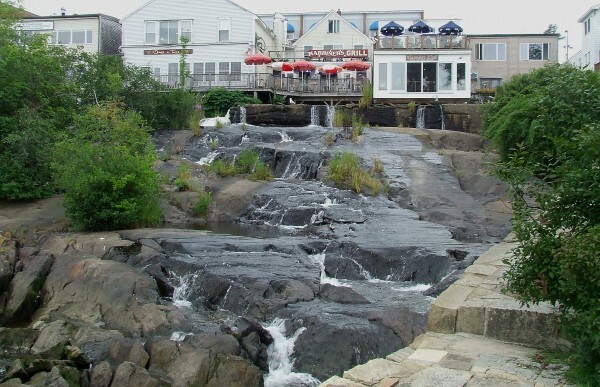 Downtown Camden lies downstream of two high-hazard dams on the Megunticook River. Megunticook East dam in Camden, a high-hazard dam, was originally constructed more than 100 years ago. It lies upstream of downtown Camden and a residential neighborhood. Maine is not living up to the state law that requires regular inspections of the nearly 100 dams in the state classified as hazardous for their potential to take lives or sweep away buildings, roads and bridges. The state has 93 such dams from Limestone to Sanford. Of those, the state classifies 24 as “high hazard potential,” meaning that mis-operation or failure could “probably cause loss of life.” The other dams are “significant hazard dams,” meaning a failure could cause property or environmental damage. 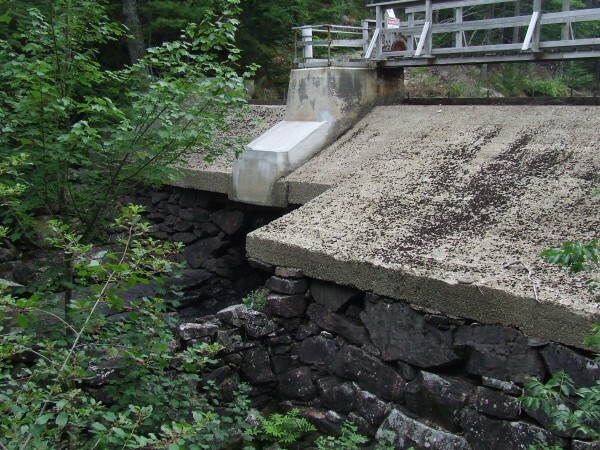 Half of the high-hazard dams are two to seven years overdue for their mandated inspection by a professional engineer, according to records provided to the Maine Center for Public Interest Reporting by the Maine Emergency Management Agency. And the state has no record of any state inspection for another 25 percent of the high-hazard dams, either because they have not been inspected or because of poor record keeping. MEMA could produce reports showing on-time inspections for only three high-hazard dams. For example, there is no record of an inspection of the dam that holds back Norway Lake, a five-mile-long lake. state report stating it is in good condition, which is the case for 40 potentially hazardous dams across the state. The records were requested by the Maine center to determine if the state is abiding by the 2001 Dam Safety Law that requires regular dam inspections every two years for the high-hazard dams and every four years for the significant-hazard dams. The pattern for the 69 significant-hazard dams was similar to the high-hazard dams: 30 dams were an average of four years overdue for inspections and the state could not provide inspection reports for another 33. The center’s findings confirmed the fears of the legislature’s leading advocate for dam safety, Sen. Stanley Gerzofsky, D-Brunswick. For most of the 20-year history of the state’s dam safety program, it has had only one engineer inspecting the state dams, from the 93 high- and significant-hazard dams to another 700 low-hazard dams. That inspector is Tony Fletcher, a civil engineer, who until recently has been the sole inspector for all the state’s dams. He now has a second inspector working with him, a recent engineering graduate who Fletcher said is learning on the job. His boss until recently was Mark Belserene, director of operations at MEMA. Most of the state-regulated dams are owned by private parties or local government. Maine’s hydroelectric dams are inspected by the Federal Energy Regulatory Commission, not the state. The current structural condition of nearly 90 percent of both types of potentially hazardous dams cannot be determined from the state’s publicly-available records because either no record was made available or the records are out of date. Pittsfield-based Kleinschmidt engineering consultants warned in a 2008 report by Christopher M. Vella, a structural engineer, that most of these dams are more than 50 years old and nearing the end of their design life. That is borne out by older inspection reports that show that some of the dams without current inspection reports were and may still be in need of repair. That high-hazard dam is six years overdue for a state inspection. Durepo Brook in Limestone was last inspected, the record shows, in 2002, but even that inspection included no tests and no subsurface or internal inspections, only a visual inspection. Under extreme storm conditions, the report said, a breach would endanger 105 people downstream, 47 buildings and five bridges. The Durepo dam is five years overdue for state inspection. An example of what can happen when a state-regulated dam fails occurred after heavy rains in December 1996, when the 81-year-old Highland Lake dam in Westbrook breached. A Portland Press Herald story reported that water gushed over Duck Pond Road bridge, gouging 10-foot chunks from the land abutting the street and forcing the evacuation of one nearby home. The Maine center asked for the most recent inspection report for the Highland Lake dam, as did the Army Corps of Engineers for its National Inventory of Dams. The state did not provide either group with a report, meaning the dam has not been inspected in some time or the state’s records don’t show one. The Army Corps of Engineers reports that a new dam was constructed 11 years ago. The center’s examination of state records is the first documentation of the extent of the problems with the state’s inspection program, but it is not the first time the problem has been raised. For example, an Association of State Dam Safety Officials study showed than in 2008, Maine’s compliance with a model inspection program was 16.7 percent, compared to the national average of 73 percent. MEMA has been in charge of the state’s dam safety program since 1989. Before then, inspections and safety enforcement were under the jurisdiction of the state Department of Environmental Protection, which still has the environmental responsibility. “The program has been dysfunctional since it went over there,” he said. “MEMA is well-intentioned but doesn’t know how to function as a regulatory agency” and prefers to “play nice” with dam owners rather than press for repairs, Murch said. McAleer said MEMA will take a dam owner to court, but rarely has, because it recognizes that most private dam owners don’t have much money and a court case would eat up what money the owner may have rather than use that money towards a repair. But McAleer also acknowledged not all problems can be detected with a visual inspection. He cited a common problem of leaks developing within a dam from rotting tree roots left when trees are cut down near a dam. He said he wished dam owners would be more alert to that problem. Asked if there were any dams that worried him, he cited two in Aroostook County, Bryant Pond and Libby Brook, both in Fort Fairfield. Libby Brook is a high-hazard dam that is overdue by four years for inspection. It is less than two miles from downtown Fort Fairfield. The state could not produce an inspection report for Bryant Pond. One of the nation’s leading experts on dam safety is Peter Nicholson, professor of civil engineering at the University of Hawaii and a summer resident of Harpswell. That’s what happened in his state just four years ago, when the Ka Loko dam on Kauai burst after heavy rains. A wall of water 60 feet wide and 20-70 feet high killed seven people and destroyed several homes. An investigation attributed the dam failure to a number of factors, including inadequate inspections and not enough dam inspectors to cover all the state’s older dams. At the time, Hawaii had 1.5 inspectors; after the breach, it got three more. That comment echoed one made by Belserene, the former dams supervisor in MEMA. He recalled the attention given to to the nation’s bridges and overpasses after the collapse of a Mississippi bridge in Minnesota in 2007 that killed 13 people. Naomi Schalit and John Christie are senior reporters at the Maine Center for Public Interest Reporting. The email address is mainecenter@gmail.com. The website is pinetreewatchdog.org. Students in the Bates College Short Term 2011 course, “There’s More to the Story,” contributed to the research for this story: Bo Cramer, Caroline Kim, Caroline O’Sullivan, Mark Lainoff, Nicole Fox, Sabina Frizell, Shachi Phene, Van Sandwick, Wylie Leabo and Jake Starke.